Operations automation in the digital home network has quickly become an essential part of global communication service provider strategies for differentiation and competitive advantage. But how are today’s operators justifying the return on investment for solutions that automate service quality management and improve customer care? 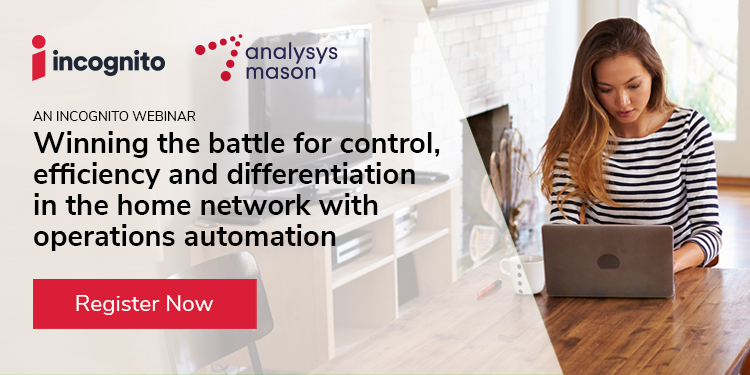 Incognito recently joined forces with Analysys Mason to produce research that highlights the imperative to introduce operations automation support for residential customers. This is the industry’s first in-depth research that evaluates today’s status quo for handling home technical issues by customer care and engineering teams—and quantifies the operational savings possible with analytics and automation best practices. Join Incognito and Analysys Mason on a webinar hosted by Light Reading on June 13 at 10:00am EST to review the research results and learn how you can gain maximum value out of improving the digital home experience. Can’t make the webinar that day? No problem. Click here and Incognito will send you a recording of the webcast.